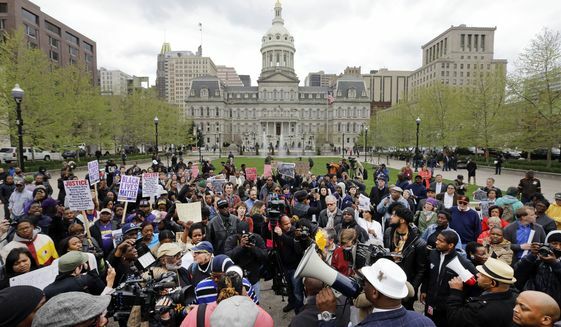 PROTESTERS IN Baltimore erupted in fury over the murder of Freddie Gray, who died in the hospital on April 19, days after his voice box was crushed and spine nearly severed while in police custody. Throughout the week that followed, protesters filled the streets demanding accountability and expressing anger at the killing of another unarmed Black man by police. The biggest demonstrations yet came over the weekend. Most of the media sensationalized the small amount of property damage that took place during demonstrations last weekend–while downplaying all evidence of the systemic racism and police violence that stirred this reaction. The outrage is another symptom of the simmering anger at the epidemic of police murder that has taken place once every eight hours on average across the country in 2015. Gray was arrested on April 12 outside of Gilmor Homes, where he lived, a few blocks away from the Western District police station in the neighborhood of Sandtown-Winchester. Police say they chased Gray and arrested him after he “made eye contact” with officers and ran away from them. The cops have not disclosed what, if anything, Gray was charged with, although they later “discovered” that Gray was carrying a pocketknife–not exactly a crime, as even Baltimore Mayor Stephanie Rawlings-Blake was forced to admit. Cell phone video shows Gray being dragged, legs limp and handcuffed, into a police van. He apparently asked for an inhaler, but was never given one. Later, the van made a stop, and Gray was put in leg irons. There were other stops, too, and other requests for medical attention, before paramedics were called about 40 minutes later. Police may have taken Gray for a deliberate “rough ride”–an illegal police technique in which unsecured suspects are driven around in a police van erratically in order to injure and frighten them. Baltimore police have a history of giving suspects so-called rough rides–including Dondi Johnson, who died of a fractured spine in 2005 after a rough ride following his arrest for public urination. FREDDIE GRAY is the latest in a long list of victims of Baltimore police that continues to the present day. In February of this year, 30-year-old Travon Scott died in a holding cell after allegedly being found having difficulty breathing–although police say no force was used in his arrest. Nineteen-year-old George V. King died from injuries related to officers striking him with a Taser in May 2014, but the officers were not charged. At age 44, Tyrone West was beaten to death by police and a Morgan State University security guard during a traffic stop in July 2013. No one was charged in his death. Forty-six-year-old Anthony Anderson’s death in September 2012 was ruled a homicide by blunt force trauma after police tackled him. But prosecutors decided the officers didn’t use excessive force–once again, no one was charged. According to the American Civil Liberties Union, between 2010 and 2014, 109 people died in Maryland after encounters with police–Baltimore City had the highest number in the state at 31. Around 70 percent of those who died from police encounters statewide were Black. Baltimore is different from Ferguson, Missouri, in many ways–yet there are similarities reflected in racial discrepancies in poverty and incarceration rates. Baltimore is a major city of over 620,000 people that is 63 percent Black, with a median annual household income of $41,000. Outside of the city, the population is 60 percent white and the median income is $73,000. The city is currently shutting off water to 25,000 residents who are behind on their unpaid water bills after a spike in rates–while it looks the other way corporate accounts go unpaid. Baltimore City schools and recreation centers have suffered a series of closures, especially in poorer Black neighborhoods. Each of the six legislative districts located in Baltimore has at least 1,000 residents incarcerated–a number not matched anywhere in the rest of the state–with Baltimore City’s Western district, which contains the neighborhood of Sandtown-Winchester, topping the list at 1,855 residents serving prison sentences. Meanwhile, fewer than 30 percent of Baltimore City police officers actually live in the city. Some 80 percent of Baltimore police are white. Since 2011, the city has used taxpayer dollars to pay out $5.7 million in court judgments and settlements for 102 civil lawsuits alleging police misconduct. THE NARRATIVE in the media is that protests against Freddie Gray’s death supposedly “turned violent” without provocation on Saturday, April 25. The press has focused on smashed windows and traffic disruptions downtown that night, the “looting” of a 7-Eleven store, and confrontations with officers near the Western District police headquarters. Ignored in these representations is that day’s eight hours-plus of peaceful demonstrations that started in the economically devastated Black neighborhood of Sandtown-Winchester, where Freddie Gray lived. Later, protesters marched through downtown and converged on City Hall, where the crowd swelled to about 2,000 people–all without incident. The media also haven’t provided context for the property damage, which some protesters say was at least partially provoked by intoxicated sports fans, downtown for that evening’s Orioles game, who reportedly shouted racial epithets and threw water bottles at a group of about 100 people who broke off from the larger march to head toward the heavily guarded baseball stadium. The claim by Baltimore officials that the property damage was the work of “outside agitators”–another connection to Ferguson–fails to acknowledge the deep and justified anger of city residents. THERE ARE many activists and organizations in Baltimore that have been doing long, painstaking work against police brutality for years, but their struggles have gone largely unreported. Baltimore Bloc has organized with the families of the victims of police brutality and monitored police activity to keep communities informed. They supported Tawanda Jones, the sister of Tyrone West, who was beaten to death by police in 2013, in her organization of weekly “West Wednesday” protests since her brother was killed. The Baltimore Algebra Project has called attention to the school-to-prison pipeline and successfully stopped a new youth jail from being constructed. City Bloc is a group of students at Baltimore City College who have led young people in protest against police brutality. The Right to Housing Alliance has been instrumental in fighting the economic violence against targeted Black communities around tenants’ rights and the water shutoffs, while also speaking out against police misconduct. This year, Leaders of a Beautiful Struggle and Rev. Heber Brown III of Pleasant Hope Baptist Church worked together to push for legislation to amend the “Law Enforcement Officers Bill of Rights,” which is a barrier to police accountability and hinders investigations of civilian complaints. The Ujima People’s Progress Party has community control of police as part of its platform and has been working to reform the Civilian Review Board, which currently does not have the power to subpoena or charge officers who have complaints made against them and rarely hears complaints. UNITE HERE Local 7, which organizes low-wage workers in the hotel, gaming, food service, airport, laundry and other service industries, unanimously voted to support the Black Lives Matter movement and has turned out in numbers at the protests against police violence. The All People’s Congress and Southern Christian Leadership Conference of Baltimore called for mass gatherings around the murders of Trayvon Martin, Mike Brown, Eric Garner and Freddie Gray. Activism in Baltimore is notoriously fragmented, but around the killing of Freddie Gray, some groups have made an attempt to work together in coalition, forming Bmore Unitedas a centralized way for people to get information, share resources and offer support around the issue of police brutality and accountability in Baltimore. Black Lawyers for Justice is planning to hold a town hall meeting on April 29, and more protests are set for Saturday, May 2. So far, the response of the political and press establishment to the Baltimore protests has centered on minor vandalism and the 34 arrests. Those arrests were mainly of young Black men, including those who had not been violent, but were targeted for merely being vocal. Many who protested peacefully refuse to distance themselves from those who broke windows because they can see how the media are using this issue to discredit the movement as a whole. In fact, the massive police mobilization–an estimated 1,200 cops from Baltimore and other jurisdictions, along with state troopers, took part in policing Saturday’s protests–has stoked entirely justified anger. In effect, the city mobilized an occupying force to stand guard in front of an empty stadium, long before sports fans arrived–a clear display of the city’s priority of protecting property, and not the lives of Black city residents. After days of protesting Gray’s murder, only to be met by more violence and repression from the robo-cops, it’s not surprising when there are bitter expressions of anger among protesters. But these examples are not the real crime–far from it. Accepting “business as usual” in Baltimore might feel like “peace” to the city’s elite, but what it actually means is more police brutality, more mass incarceration, more economic violence, the devastation of Black communities and more deaths–and that deserves to be disrupted until we have justice. Ben Blake contributed to this article.